Future Fund chairman David Murray has urged governments to heed the lessons of the European and US sovereign debt crises as growing state and federal borrowing pushes their financial liabilities past half a trillion dollars in the new financial year. 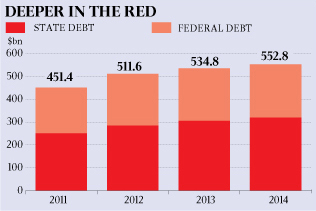 Analysis by The Australian finds the states are forecasting their net-debt levels will surge from almost $102 billion this year to $135bn next year to help fund upgrades to rundown electricity, water and other infrastructure. This will help push their net financial liabilities – a figure that includes liabilities for pension benefit schemes – to a record $285bn next year. On top of this, the federal government’s net debt levels will rise from $82bn this year to $107bn next year – largely to fund the budget deficit – helping to drive their liabilities from $200bn to $227bn. The surge in debt prompted Mr Murray to warn that this could force the private sector to compete for funds as the resources sector booms. All of which is exactly what Barnaby Joyce warned of 18 months ago, and repeatedly since. It’s also worth noting that this is the boss – though not for much longer – of the Future Fund. Pinching public servants’ superannuation will only be the beginning. We know this simply by looking at what is happening abroad. Learn all about the wave of government confiscations of private superannuation savings that is quietly sweeping the Western world, and how both major parties in Australia already have policies to do the same, in “No Super For You!!”. Those kind of debt levels would even make Jack ‘We don’t owe the Bank of England as much as a bent sixpence’ Lang blush. No journalists with balls to highlight the situation through the popular papers .. either the journalists are bent or they are stupid, or the newspapers editors (oops owners) are just as stupid and bent! Feel like telling these so called professional economists (excluding Keen) that It is the debt and wake up. I know that Keen is held in high esteem throughout the world, except for Australia .. his peers are putting the skids under him in Oz, as they are corrupt and contradicted. The only thing about Keen is he ‘likes’ government bonds, I heard him say so. He talks a lot about Ponzi economics but ignores the root of the problem. The credit of the government is not money, there is no solution to the rolling economic crises of the world until this is acknowledged.